Today, the fifth day of our campaign, we will be sending a fax to House Representative Dennis Kucinich. 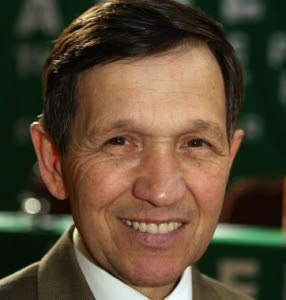 Mr. Kucinich has repeatedly demonstrated himself to be on the side of truth and justice, and on the side of the people, and he has shown himself to be a very open-minded, rational human being. We are encouraged by his criticism of the war, his receptiveness to 9/11 truth, his policies regarding the abolition of the Federal Reserve, and we hope that he will devote the same passion to the cause of bringing this paper to light once he reads it. Let’s send him a fax asking him to take a look at this evidence. Please take two minutes to send Rep. Kucinich a fax asking him to take a look at the “Active Thermitic Material” paper. You can use the sample letter provided below or write your own. As always a polite, respectful tone is preferable and you can send a free fax over the internet by going to www.faxzero.com. I have been a fan of yours for years and applaud the work that you do in Washington. You strike me as someone who has a deep desire to find out the truth no matter where it leads you. I feel that all politicians should possess this quality and thus have admired the various unpopular stances you have taken throughout the years knowing that you were on the side of the truth and justice. I would like to begin my formal request to you with a quote from the late John F. Kennedy: “Those who make peaceful revolution impossible will make violent revolution inevitable.” I am writing to you as a concerned citizen attempting to use my democratic mechanism of control over my government in order to have a public discussion of certain pertinent facts. These facts are available online in a peer-reviewed, scientific paper published in the Bentham Open Chemical Physics Journal. The title of this paper is “Active Thermitic Material Discovered in Dust from the 9/11 World Trade Center Catastrophe.” The authors of the study conclude that they have discovered within the dust from the World Trade Center disaster on September 11, 2001, unexploded particles of nano-thermite, a military-grade explosive. This type of explosive is very advanced and it is practically guaranteed that Al-Qaeda could not have gotten access to this sort of material. The Vice President has received this paper and has promised to investigate it, but so far no developments from him. Likewise from the 15+ members of Congress who received it. I know you to be a very intelligent person Mr. Kucinich and so I know you realize the implications of these findings if they are proven true. It would constitute the highest form of treason. Therefore I am asking for your help in raising awareness of these new findings so that they can be verified or disproven by an able panel of judges. I am not asking for a new investigation into all of 9/11, I merely want a full investigation of the claims made in this paper. I consider them to be of the highest significance, and I hope you will as well. I know that you have been receptive to the idea that we need a new investigation into 9/11 in the past. I therefore hope that after you have had a chance to review this material you will realize how important it is to investigate further and will join me in pushing for a full scientific review of this paper. Together I know we can get to the bottom of this and move on as a nation. Only the bravest of Congressmen would dare stand up for such a controversial issue, and that is why I am writing you. If there is a braver member of Congress than you, I don’t know who it is. Thank you so much for everything you do in Washington. All the best to you and yours Sir and may you have continued success in this upcoming session of Congress. I have recently learned that Congressman Brad Shermans policy people are currently looking at the Nano Thermite paper. Lets make sure he is given some encouragment as well. Congressman Sherman has also spoken out against the bankers and asked some serious questions. Ed Brotherton on Sat, 09/05/2009 - 2:16pm. KNOWAR on Sat, 09/05/2009 - 7:18pm.